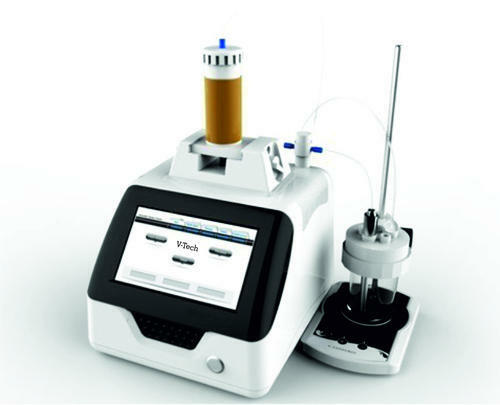 VT-860 Automatic Titrator is a Top Lab Automatic titration device with high analysis accuracy under the principle of potentiometric titration. It enjoys modular design, consist of three parts: volume titration device, control device and measuring device. The titration methods include macro titration, microtitration, volume setting titration, EP, etc. It has pre-titration, preselected endpoint titration, blank titration and manual titration modes. Sensors/Electrodes can choose to conduct acid-base titration, redox titration, precipitation Titration, complexometry titration, non-aqueous titration and pH value measurement. We, "Nunes Instruments", established in the year 1975, have extensive industry experience of 38 years, we are able to flourish widely in the industry. We are one of the leading Exporter, Importer, Distributor and Service Provider of Agricultural Instrument and Electrical Measuring Instrument. These are products are highly appreciated in the market for their efficiency, robustness, accurate results and durability. Moreover, these are widely catered to various industries for material testing and quality control tests. We are engaged in providing Instruments Repairing Services, Rental Services, Buy Back Exchange Offers & Calibration Services. Our professionals have several years of experience and are thoroughly trained in all aspects of Instruments repair and service work of Measuring Instruments, Laboratory Instruments, Control Instruments and Test Equipment. We sell and supply all kind of spare parts for Laboratory Instruments and Equipments. We are interested in associating with reputed manufacturers and distributors to work as their authorized dealers and authorized service centers. Our Estimated clients are Southern Railway, Salem Steel Plant, Steel Authority of India Limited, Roots Industries Limited (Coimbatore), The Sree Meenakshi Mills Limited and many others.